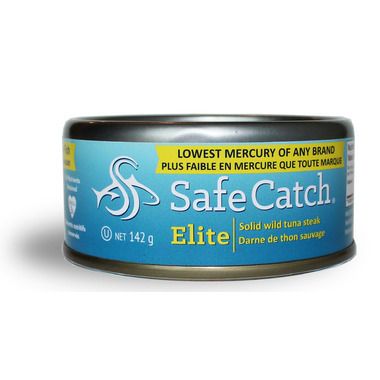 Safe Catch Elite Tuna is Safe Catch's lowest mercury tuna. It's a great choice for athletes, kids and pregnant women. It is the only brand of tuna that meets Consumer Reports' "Low Mercury" criteria set for pregnant women and children. Each premium tuna is hand picked, tested and hand packed. Slow cooked to perfection. No added oil, water, fillers, preservatives or broth. Just pure wild tuna! Do not drain. Ingredients: Skipjack tuna (Katsuwonus Pelamis) and salt. Love it! This is the only brand I buy. Delicious, sustainable, low in mercury. Perfect!